The DP1610 digital indicator is an easy-to-operate microprocessor-based instrument, incorporating the latest in surface mount and CMOS technology. The instrument is a high visibility, full range digital indicator with the flexibility to accommodate thermocouple, RTD and dc inputs. These inputs can be scaled and ranged from the front panel without calibration. Excellent accuracy combined with small size and useful output options make the DP1610 a highly attractive, low cost solution to industrial measurement and indication. 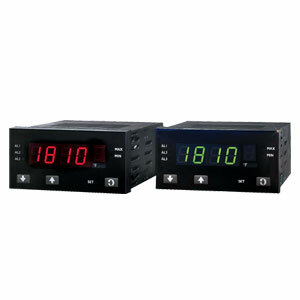 Using the maximum and minimum hold feature, the DP1610 allows maximum and minimum measured variables to be stored and subsequently viewed, even after power down. The units are supplied with a face plate that has a clear window to display the engineering units being measured. Engineering unit labels are supplied for: %, °F, °C, mV, V, mA, A, kW, W, lb, rpm, atmos, ppm, ft., %RH, inHg, psi, GAL, GPS, GPM, GPH, GPD, and MGD. 注: Basic unit comes with 1 relay output built-in. Up to 2 more outputs and 1 add' option can be added.